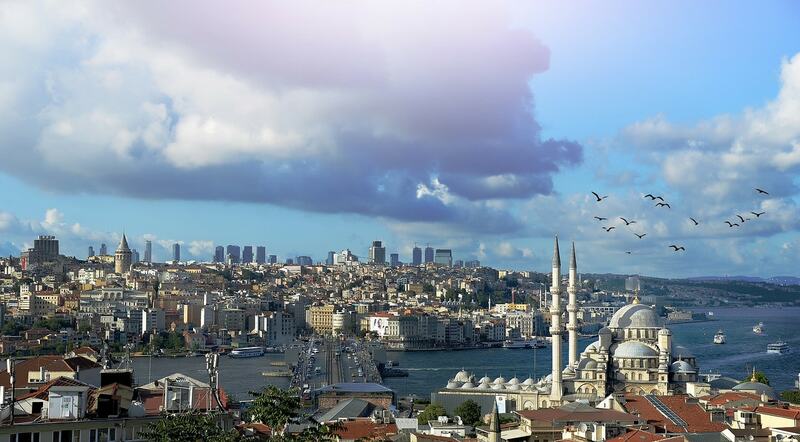 Istanbul is the historic, cultural, and economic center of the Republic of Turkey — the city has approximately three thousand years of history and traditions. You’ll see the city’s vast history everywhere you look, boasting amazingly preserved architectural stunners including Hagia Sophia (532-537 A.D.) and the Basilica Cistern (542 A.D.). There’s no question about why this city has been fought over for centuries, it is a transcontinental city, meaning that the city is geographically set in Europe and Asia and it is home to 14.7 million residents making Istanbul one of the world’s most populous cities. Istanbul has incredible history and equally incredible food, trust me. The eats that are found in this city will blow your mind just as much as the original stonework of a structure that is over one thousand years old that line the streets. Istanbul has so much to offer an adventurous soul — let’s get eating! Have you ever wanted a true feast for breakfast? 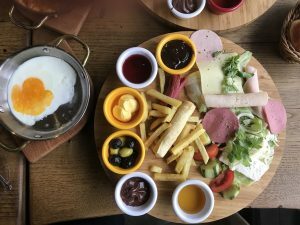 You’re in luck, Istanbul restaurant’s knows how to impress — the traditional Turkish breakfast, better known as “kahvalti” is the brunch you’ve been searching for. Kahvalti is a line-up that offers olives, fresh cheeses, bread, fruit, jams and spreads, eggs, and topped off with a big brew of black tea. This feast will keep you going through a morning of sight-seeing without that heavy, too-full feeling. 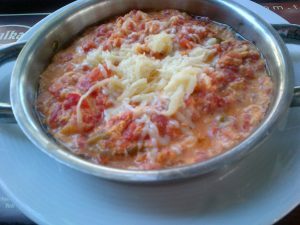 Another option for breakfast: Menemen. This dish is basically scrambled eggs with tomatoes and peppers that are served in a seemingly ancient aluminum pan. At first glance, menemen seems simple, but the flavors that hit your pallet are surprising and powerful. This dish is creamy, fluffy, and simply delicious. You can’t go to Turkey without treating yourself to their variation of coffee. I like to get Türk Kahvesi in the afternoon or after a large meal. Two warnings: It will hype you up for the rest of the day and it is unfiltered. Meaning that the coffee will have the grounds at the bottom of the tiny, pack punching glass. Be careful as you’re sipping or you’ll get a mouthful of coffee grounds. To drink like a true local, take your time to sip the 2-3 oz drink while soaking in the sound and sights of the incredible city that surrounds you. It’s time for a snack. As you walk the streets of Istanbul, you’ll notice little carts on almost every corner that smell of charcoal smoked chestnuts (which are delicious), but accompanying these fragrant little nuts is Simit. 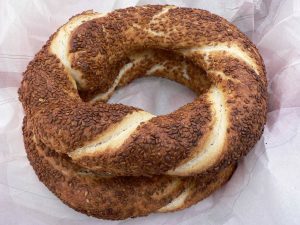 Simit is a circular bread that’s completely encrusted with sesame seeds or poppy seeds. I’m told that there isn’t a more Turkish snack than these crunchy and chewy breads. The best place to enjoy Simit is while waiting in line at some of the more crowded architectural sites or by the water looking back at the city. To find Simit, just follow the comforting smell of smoking chestnuts. For lunch, hit the streets. Eating balik ekmek will be one of the most memorable things you’ll do in Istanbul, and that’s saying something. 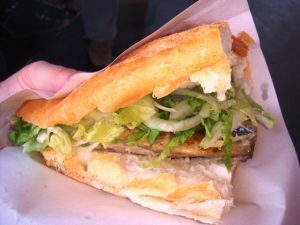 Basically, balik ekmek is a sandwich with lettuce, onion, mayo, and a grilled fish on sliced bread. This isn’t an ordinary fish, it’s a mackerel that was literally just caught off the side of the boat serving it, put on the grill (skin, bones, and all), and thrown on the sandwich. This street food item is a must-have for all adventurous eaters! The sun has set and it’s time for dinner. 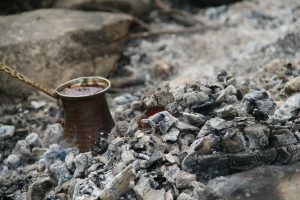 In my mind, the only option for dinner is testi kebap — a lamb stew that is sealed in a ceramic pot that’s slowly cooked over charcoal. 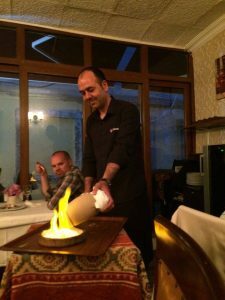 The dish is brought to the table in a ceramic pot over an open flame (and in the interest of show) the server will chisel the pot until it can be broken with a saber champagne style and poured into bowls! Not only does this dish provide an exciting dinner spectacle, the flavors and aroma of thyme and lamb will become the perfect ending to a magical day. Previous post Vino en Mexico? You Bet Your Grapes! Scott Bay is a freelance writer that reports on the latest technology trends; specializing in travel, design, and wellness. He also dabbles in furniture design and if he’s not working, he’s traveling.